HipAthletics has been serving the Pole Vault community since 2001. We specialize in Pole Vault skill development and training. We help in developing the individual to be the best pole vaulter they can be. We have help both male and female vaulters to develop to be National and State Champions. The Pole Vaulters we have training have exceeded and set new State records and place respectfully high in National Track and Field Championship. Most of our Pole Vaulters have gone to some of the best Colleges and University in the country such as; Princeton, Cornell, Dartmouth, Duke, Arkansas, Temple, Rutgers, Delaware and much more.... Some have received very nice scholarships for their Pole Vaulting skills. New Jersey Association USATF# 07-0980. We are the first and only Pole Vault Exchange Program in the United State servicing College, High School and individuals to make sure the vaulter can be on the appropriate pole to match for their vaulting skills. At HipAthletics, our goal is to provide you with courteous, expedient, professional service of the highest caliber. Browse our Web site for more information about HipAthletics. If you have any questions or would like to speak with a representative regarding our Pole Vault training sessions and/or our Pole Vault Exchange Program, please e-mail us at info@hipathletic.com or call us at 609-504-2605. At HipAthletics., the Pole Vaulter always comes first. HipAthletics offers the highest quality of training and service on the market today. Since we started, we have provided superior service to our customers and have assisted them in achieving their goals. Our years of experience and commitment to excellence have earned us the reputation as the best Pole Vault development in the area. Our Values include: Leadership: At HipAthletics, you receive the kind of quality and service you expect from a leader. Our company is always evolving as the needs or our customers change and as new opportunities are created in the market. You can rest assured that, working with HipAthletics, you will enjoy the latest services, technology and developments in the industry. Pole-vaulting can be an expensive sport. 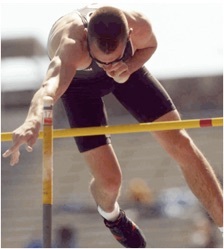 Most Pole-vaulters require a series of 3 to 4 poles to compete at a consistent and high level. Keeping a daughter or son on the correct pole can be an ongoing cost, with poles costing from $235-$650 dollars. Not only are the poles expensive, but also in many cases it is difficult to select and attain the right poles to fit their ability. High Performance Athletic Co. maintains an inventory of poles, which enables the correct selection of poles. Access to the High Performance Athletic Co. pole pool provides members with the knowledge of what poles they need, and reduces the pole expense associated with purchasing vaulting poles as the Pole-vaulter develops.